The elevated site for Bishopscourt was selected by BishopPerry,firstBishop of Melbourne, in 1848. Tenders for Bishopscourt werecalledbyarchitects Newson and Blackburn in 1849. The site was partlyclearedandconstruction began only to be delayed by labour shortagescaused bytheonset of the Gold Rush. In 1851 architects Russell andThomascalledtenders for the completion of Bishopscourt, and by January1853 itwasready for occupation by Bishop Perry and his wife. Whencompletedin1853 Bishopscourt consisted of a two-storey bluestonebuildingwithtower, flanked on the north side by a one-storey wing. Inlate1854architect Charles Swyer was engaged to lay out the grounds butitisunknown what these works actually were. It is possible thatNewsonandBlackburn were the principle garden designers, siting theresidenceinits corner position east of an ancient River Red Gum whichsurvivedonthe site until the 1990s. In 1857 a reservation was made foracathedralto be built alongside Bishopscourt, between Hotham andGeorgeStreets,but eventually the parish church of Holy Trinity usedthesite.Bishopscourt became Government House temporarily between 1874and1876.Fifty years after its construction Bishopscourt was foundcostlytomaintain, inconvenient and unsatisfactory as a residenceandarecommendation was made for its demolition and replacement.Therewasmuch deliberation and a compromise was met and in 1903thenorthbluestone wing was demolished and replaced with a brickwing.ArchitectsInskip and Butler who also altered the gardens at thistimedesigned theFederation Queen Anne Domestic style red brick wing.Lateradditionswere carried out on the east side of the red brick sectioninthe 1960s.Of the original 1853 house only the bluestone exteriorandtowersurvive. The interior of the building has been altered manytimesasBishopscourt was renovated before each new bishop or archbishopmoved in. 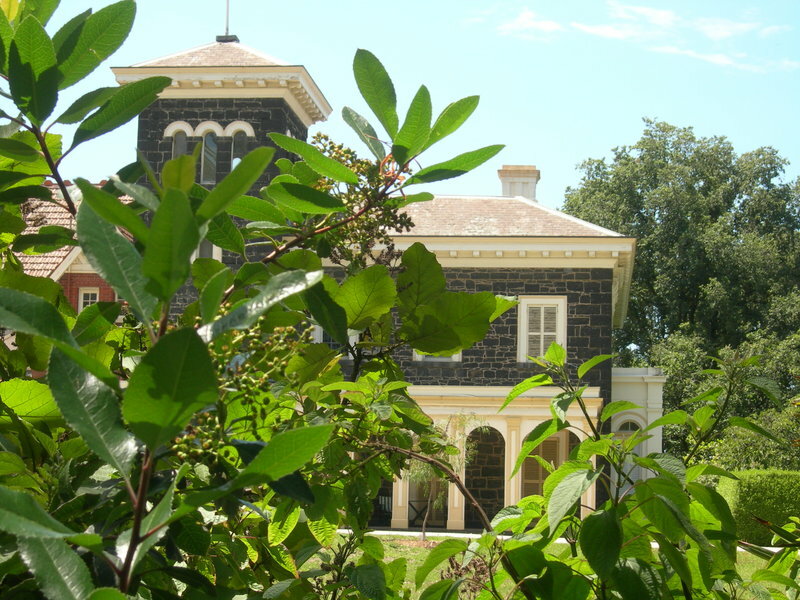 Bishopscourt is of historical, social,aesthetic,architectural,scientific and archaeological significance tothe State of Victoria. 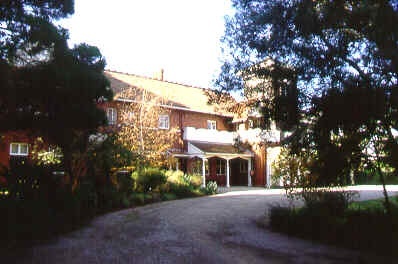 Bishopscourt is of historical and social significance as theoldesthousein East Melbourne and as the residence of the Anglican BishopandlaterArchbishop of Melbourne since 1853. Being the last intacturbanestate inthe City of Melbourne the grounds of Bishopscourt areofoutstandinghistorical significance. Bishopscourt is a raresurvivingexample withininner Melbourne of a mansion with its gardensettingstill remainingsubstantially intact. The Bishopscourt gardens areofsocial significanceas they have been the venue of officialhospitality,garden parties,fetes and carnivals over many years. Bishopscourt is of architectural significance as the bluestonesectionofthe house is an important example of early Melbournearchitecture.Itsassymmetrical form with tower and arcades was theprecursor of manygrandMelbourne mansions. The rubbled bluestone, simplemouldings andFrenchwindows reflect early building techniques. The 1903red brickaddition isof architectural interest as an interesting solutionto adesign problemand for its detailing to enable its integration withthe1853 bluestonesection. Bishopscourt is of great aestheticsignificancefor therelationship between the residence and grounds,forming animpressivespace that continues the grand proportions of theadjacentFitzroyGardens. The position of the residence and thepicturesquelandscape witha sweeping drive and lawn creates the illusionof muchlarger grounds.The enclosed formal south garden with fountain isalsoof aestheticimportance contributing to the picturesque landscape. The Bishopscourt gardens have landscape and scientificsignificancefortheir collection of mature plants, particularly trees ofevergreenanddeciduous species. Because of their historic, aesthetic,botanical and in certain instances scientific (notably T8 Ilex perado subsp.platyphylla and T13 Ficus rubiginosa) significance, the trees recorded in the extent of registration provide an importantcontribution and context to the place.The north east corner of the sitein particularis of archaeologicalimportance for its potential to yieldinformation onthe outbuildings,cess pits and glasshouses which onceoccupied the site. Bishopscourt, 120 Clarendon Street, East Melbourne, Melbourne City Council. 1. All the building known as Bishopscourt B1 and Bluestone Fence and Gates B2 marked on Diagram 27 held by the Executive Director. 2. All the landscape features marked D1 Sweeping Drive (including glazed terracotta spoon drain), P1 Flagstones, S1 Sundial, F1 Fountain and the following Trees marked on Diagram 27 held by the Executive Director. 3. 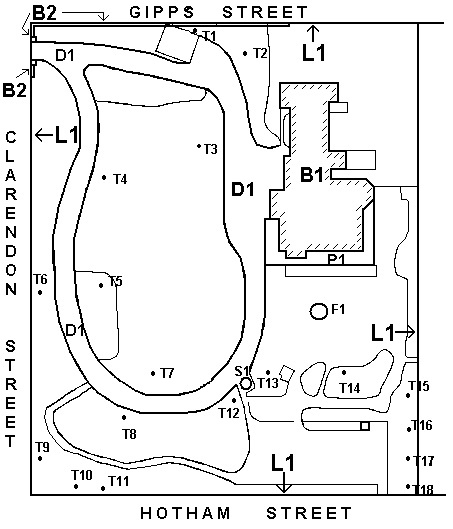 All the land marked L1 on Diagram 26 held by the Executive Director, being all the land described in Certificate of Title Vol. 684 Folio 632. The first Government Grants in East Melbourne were held in 1852, and the last in 1870, with the exception of the Yarra Park subdivision which was not offered for sale until 1881. These first East Melbourne land sales coincided with the prosperity of the gold rush, and choice blocks in the vicinity of Bishopscourt, completed in 1853, brought up to £2000 making the Government reserve price of £300 look ridiculous. East Melbourne ws immediately recognised as a most desirable residential area, and from the beginnings of its settlement attracted a large proportion of residents who were something important in the city. East Melbourne appears to have had in those days little community life of its own. It had no common focal institutions. The sense of community and social activity that it did have centred around the churches of some dozen religious denominations which flourished within its boundaries. From 1860 to 1890 an exceptionally large proportion of Victoria’s leading figures in politics, commerce and the professions slept in East Melbourne, but the activities which made them prominent were carried out in the city (Burchett 1975 p. 9). The original Crown Grant for Bishopscourt was two acres, but the Grant issued on 18 February 1851 was for four acres one rood and comprised the whole Section 13 of 20 allotments bounded by Clarendon, Gipps, Powlett and Hotham Streets. It was particularised for dwelling 2 acres 20 perches, church 1 acre. 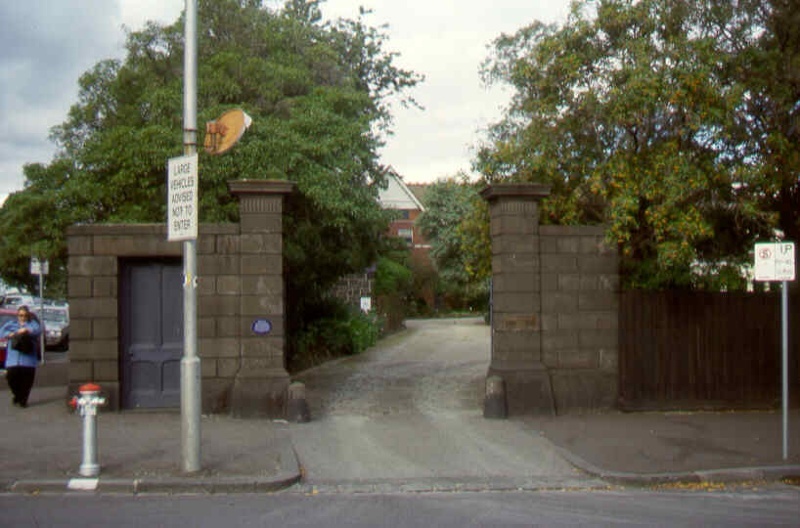 It appears that by mutual consent the grant was later revised and reduced to twelve allotments from the Clarendon Street frontage back, on this section, and in handsome compensation, more than two acres fronting Clarendon Street in the next Section south, between Hotham and George Streets (Burchett 1977 p. 70). The elevated site for Bishopscourt was selected by Bishop Perry, first Bishop of Melbourne, in 1848. He was offered more extensive sites further from the city, but wished to be within walking distance of his parishioners (Burchett 1975 p.25). The first Crown Land Sales in East Melbourne were held in 1852, and absurdly high prices were paid for lots close to Bishopscourt and the proposed Cathedral, for which half the next block fronting Clarendon Street was reserved. (Burchett 1975 p.26). The elevated site for Bishopscourt was selected by Bishop Perry, first Bishop of Melbourne, in 1848. Tenders for Bishopscourt were called by architects Newson and Blackburn (presumably James Blackburn Senior) in 1849. The site was partly cleared and construction began only to be delayed by labour shortages caused by the onset of the Gold Rush. In 1851 architects Russell (presumably Robert Russell) and Thomas called tenders for the completion of Bishopscourt. By January 1853 for double the original estimate Bishopscourt was ready for occupation by Bishop Perry and his wife. The gold rush interfered with progress, and it was not until 1853, In 1857 a reservation was made for a cathedral to be built alongside, between Hotham and George Streets, but eventually the parish church of holy Trinity used the site. On completion in 1853 Bishopscourt consisted of a two-storey bluestone building with tower, flanked on the north side by a one-storey wing. In late 1854 architect Charles Swyer was engaged to lay out the grounds but it is unknown what these works actually were. It is possible that Newson and Blackburn were the principle garden designers, siting the residence in its corner position east of an ancient River Red Gum which survived on the site until 1998. In 1857 a reservation was made for a cathedral to be built alongside Bishopscourt, between Hotham and George Streets, but eventually the parish church of Holy Trinity used the site. Bishopscourt became Government House temporarily between 1874 and 1876. Bishop Perry had gone to England and, as the new Government House was not ready, Governor Sir George Ferguson Bowen and later the Acting Governor, Chief Justice Sir William Stawell were in residence, until Bishop Moorhouse was appointed. After fifty years the building was found costly to maintain and inconvenient and unsatisfactory as a residence. A recommendation was made that it be demolished and replaced. The proposed demolition of the old place is viewed with regret by members of the Anglican Church and by old colonists of every creed (Burchett 1977 p. 53). There was much deliberation and a compromise was met and in 1903 the north bluestone wing was demolished and replaced with a brick wing. Architects Inskip and Butler who also altered the gardens at this time designed the Federation Queen Anne Domestic style red brick wing. Details of the garden alterations are unknown. Later additions were carried out on the east side of the red brick section in the 1960s. Of the original 1853 house only the bluestone exterior and tower survive. Newson and Blackburn called tenders for the construction of Bishopscourt in 1849. The Blackburn here is assumed to be James Blackburn senior. Born in Upton Essex in 1803, Blackburn was trained as an engineer, surveyor and architect and in 1833 was employed by the Commissioner for sewers for Holburn and Finsbury in London. He forged a cheque for £600 and in May 1833 was transported for life to Tasmania. His wife and daughter followed in 1835. Immediately on his arrival he was employed by the Department of Roads and Bridges and completed extensive works across the state. In 1841 he received a free pardon and entered a private practice with James Thomson, executing many fine buildings. In April 1849 he sailed from Tasmania for Melbourne and set up private practice. On October 24, 1849 he was appointed City Surveyor and in 1850-1851 he designed the Yan Yean Water system. He died in March 1854. Walter Richmond Butler was born 24 March 1864 at Pensford, Somerset England. At 15 he was articled to architect Alexander Lauder of Barnstaple. In 1885 W.R. Lethaby encouraged Butler to move to London and work with J.D. Sedding. He was accepted into the arts and crafts and domestic revival circles centred on William Morris and R.N. Shaw, among whom his closest friend was Ernest Gimson. In June 1888 Butler left sedding’s office and sailed for Australia, perhaps at the prompting of young Melbourne architect Beverley Ussher then visiting London. On 25 April1894 Butler married Emilie Milicent Howard. From 1889 until 1893 Butler was in partnership with Ussher. In 1896 he was joined by George C. Inskip but they parted in 1905 after a dispute. In 1907-16 he partnered Ernest R. Bradshaw and after World War 1 he was in practice with his nephew Richard as W. & R. Butler, which briefly included Marcus Martin. In the late 1930s Butler was in partnership with Hugh Pettit, but he retired when Pettit enlisted for World War II. Many of Butlers clients were wealthy pastoralists and businessmen and he designed numerous country houses and large houses for the Melbourne Suburbs, including Blackwood (1891) near Penshurst and Warrawee (1906) Toorak, for A. Rutter Clark. 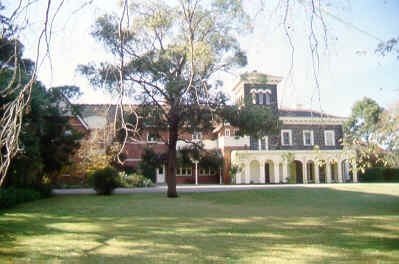 As an architect to the diocese of Melbourne from 1895, he designed the extensions to Bishopscourt. His other church work includes St Albans, Armadale (1899) and the Wangaratta Cathedral (1907). For the Union Bank of Australia he designed many branch banks and was also associated with several tall city buildings such as Collins House (1910) and the Queensland Insurance Building (1911). He died at his home in Toorak 31 May 1949. 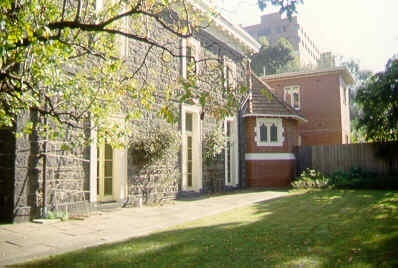 Bishopscourt is of historical significance as the oldest house in East Melbourne and as the residence of the Anglican Bishop and later Archbishop of Melbourne since 1853. 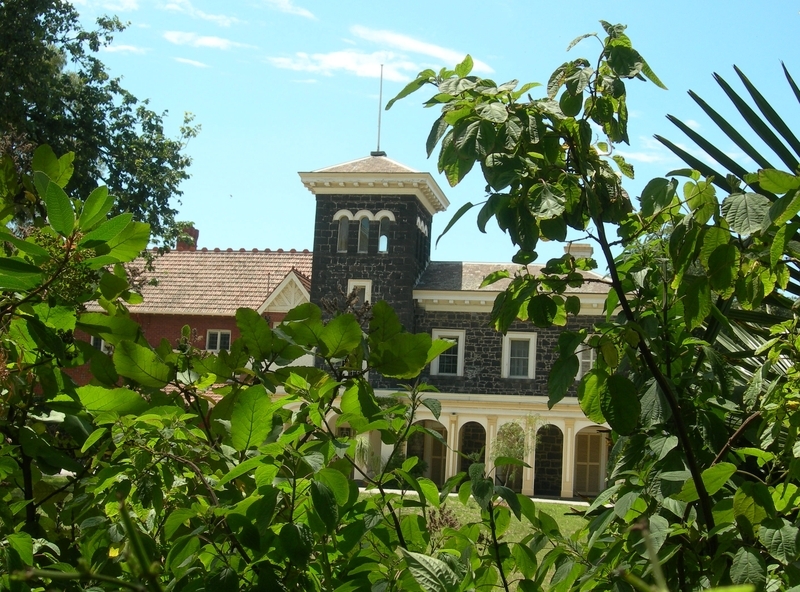 Being the last urban estate in the City of Melbourne the grounds of Bishopscourt are of outstanding historical significance. Bishopscourt is a rare surviving example within inner Melbourne of a mansion with its garden setting still remaining substantially intact. The north east corner of the site in particular is of archaeological importance for its potential to yield information on the outbuildings, cess pits and glasshouses which once occupied the site. 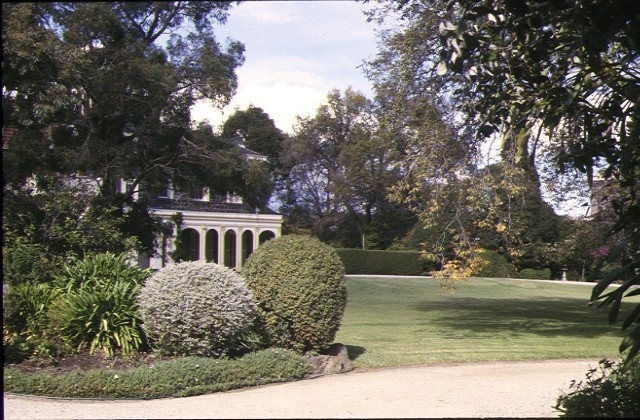 Bishopscourt is of architectural significance as the bluestone section of the house is an important example of early Melbourne architecture. Its asymmetrically form with tower and arcades was the precursor of many grand Melbourne mansions. The rubbled bluestone, simple mouldings and French windows reflect early building techniques. The 1903 red brick addition is of architectural interest as an interesting solution to a design problem and for its detailing to enable its integration with the 1853 bluestone section. Bishopscourt is of great aesthetic significance for the relationship between the residence and grounds, forming an impressive space that continues the grand proportions of the adjacent Fitzroy Gardens. The position of the residence and the picturesque landscape with a sweeping drive and lawn creates the illusion of much larger grounds. The enclosed formal south garden with fountain is also of aesthetic importance. The Bishopscourt gardens have landscape scientific significance for their collection of mature plants, particularly trees of evergreen and deciduous species. The south east corner of the site although not retaining early vegetation is important for its use as an orchard. The Bishopscourt gardens are of social significance as they have been the venue of official hospitality, garden parties, fetes and carnivals over many years. 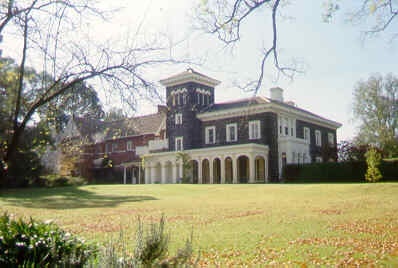 Bishopscourt has been the residence of the Anglican Bishop and later Archbishop of Melbourne since 1853. Bishopscourt has strong associations with the eleven men who have served in that position, as well as the extended clergy and parishioners. *Minor repairs and maintenance which replace like with like. *Removal of any extraneous items such as air conditioners, pipe work, ducting, wiring, antennae, aerials etc, and making good. *Installation or repair of damp-proofing by either injection method or grouted pocket method. *Painting of previously painted walls and ceilings provided that preparation or painting does not remove evidence of the original paint or other decorative scheme. *Removal of paint from originally unpainted or oiled joinery, doors, architraves, skirtings and decorative strapping. *Installation, removal or replacement of carpets and/or flexible floor coverings. *Installation, removal or replacement of curtain track, rods, blinds and other window dressings. *Installation, removal or replacement of hooks, nails and other devices for the hanging of mirrors, paintings and other wall mounted artworks. *Refurbishment of bathrooms, toilets including removal, installation or replacement of sanitary fixtures and associated piping, mirrors, wall and floor coverings. *Installation, removal or replacement of kitchen benches and fixtures including sinks, stoves, ovens, refrigerators, dishwashers etc and associated plumbing and wiring. *Installation, removal or replacement of ducted, hydronic or concealed radiant type heating provided that the installation does not damage existing skirtings and architraves and provided that the location of the heating unit is concealed from view. *Installation, removal or replacement of electrical wiring provided that all new wiring is fully concealed and any original light switches, pull cords, push buttons or power outlets are retained in-situ. Note: if wiring original to the place was carried in timber conduits then the conduits should remain in-situ. *Installation, removal or replacement of bulk insulation in the roof space. * Repairs, conservation, and maintenance to hard landscape elements, buildings and structures, sculptures, fountain, sundial, steps, paths, roadways and gutters, drainage and irrigation systems, edging, fences and gates. * The process of gardening; mowing, hedge clipping, bedding displays, removal of dead plants, disease and weed control, emergency and safety works and landscaping and planting to retain the existing landscape character. * In the event of loss of any tree specified in the Extent of Registration, replanting with the same species of tree as that removed. * Installation, removal or replacement of garden watering and drainage systems. The main significance of Bishopscourt lies in the early bluestone section, for its presence as the earliest surviving building in East Melbourne and for its surviving early building fabric, exterior and interior. The exterior of the 1906 red brick extension is of importance and should be protected. The interior features of the whole residence which demonstrate the occupation by Bishops and Archbishops should be protected. Of particular importance are the chapel and the entry foyer with staircase. The whole of the Bishopscourt grounds is of importance as a rare surviving urban estate with picturesque grounds and should be retained.